When it comes to skiing and snowboarding, a little professional help goes a long way. Whether you’re taking to the snow for the first time or you’re a seasoned expert with years of experience, there’s always room for improvement. In the Alps over the last 25 years, two international ski schools have set themselves apart from the competition; Oxygène and Magic. For our money, they’re the best in the game. Oxygène began life in La Plagne in 1992 before expanding to Val d’Isère in 1997, the Three Valleys in 2004 and Belle Plagne in 2012. Meanwhile, Magic grew out of Méribel then set up camp in neighbouring Courchevel and La Tania. The company then moved into Val Thorens, broadening their scope across the Three Valleys. The two ski schools merged last season, and the Alpine resorts now covered include La Plagne, Belle Plagne, Val d’Isère, Courchevel, plus La Tania, Méribel and Val Thorens. Under the expert tuition of Oxygène and Magic, skiers and snowboarders of all ages and abilities can hone their skills in a fun and supportive environment. A cursory glance across the Oxygène and Magic websites is enough to see the impressive range of tuition available. Although both schools offer slightly different products, the care and attention given to the learning process remains the same. Children’s classes offer tailored instruction for small groups, with classes available from complete beginner to pro-rider. Supervised lunch clubs mean parents can rest assured knowing the kids are looked after, allowing them to make the most of their time in the mountains. 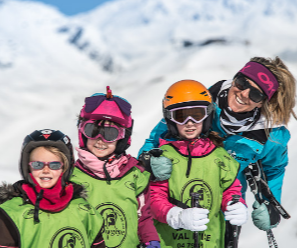 On that note, if you’re considering putting your children into ski lessons this winter, read our sister company’s blog on the best age to introduce kids to skiing. The adult lessons available cover a diverse range of goals including learner, freestyle and specialist clinics. From on-piste beginner lessons to off-piste, park and powder courses, skiers and snowboarders can hone their technique and push their skills to the next level. To skiers and boarders of a certain ability-level, the backcountry offers the greatest thrills and biggest challenges. The advanced guiding services Oxygène and Magic run put safety at the forefront, with heli trips and paragliding experiences to help advanced skiers make the most of the mountain terrain. Whether you’re taking on the north face of the Bellecôte glacier in la Plagne or bouncing through the steep and deep in the Three Valleys, you’ll have an instructor on hand to improve technique and navigate the pitfalls. With a strong focus on bringing the best of the Alps to people of all abilities, Oxygène and Magic offer adaptive lessons for less able-bodied snow-lovers. Custom-fit and carefully tailored to each individual’s needs, the adaptive classes use dual-ski, sit-ski and taxi-ski technology to ensure a fantastic skiing experience. Across their diverse resort portfolio, Oxygène and Magic have teamed up with select rental companies to bring the ski and snowboard hire process to people’s chalets. Gone are the days of long queues at the ski hire shop — now, the technicians come to you. If you’re planning a trip to the Alps and you’re keen to know more about the various ski school options in your chosen resorts, we’re always happy to help. Call today on 020 3080 0202, or reach us via our online chat service.